CF Stinson, a leading resource for performance fabrics for workplace, healthcare, hospitality, and education interiors is collaborating with Art of Board (AOB,) a brand known for its one-of-a-kind, artisan tile surfaces made from used, recycled skateboards, to introduce a skateboarding-inspired textile collection at NeoCon 2017. Held in Chicago June 12-14 at the Merchandise Mart, NeoCon is North America’s largest exposition and conference for commercial furnishings and finishes manufacturers and the interior design profession. 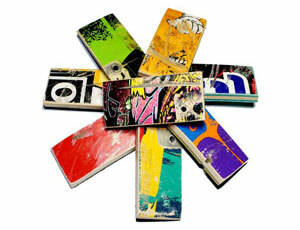 Colorful graphics taken from recycled skateboard decks and collaged with exuberance. Digital printing captures the detail and complex color. Polyurethane coated fabric with textured emboss. Skateboards are typically made with 7 plys of wood. 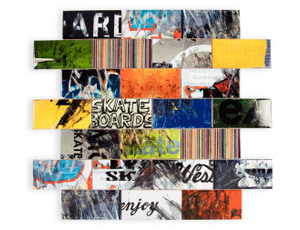 Skateboards stacked and cut reveal the beauty in the various layers. Complex jacquard woven in rich multicolor. Cotton yarns used for softness and to yield a casual and comfortable hand. 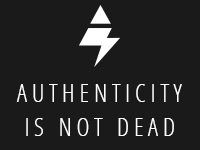 Skateboards become a virtual storyboard of the skater’s history through stickers, scrapes, dents and applied art. Complex jacquard woven with fine detail and carefully executed color. High content of recycled polyester. 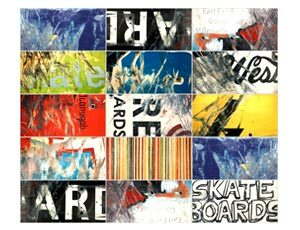 Skateboard decks cut into circles have a playful, oversized dimension that Stinson interprets into textiles with extreme quilting. Jacquard textile that uses construction expertise to create stuffed layers. Cotton yarns used on the face to authenticate a heavy quilted blanket. 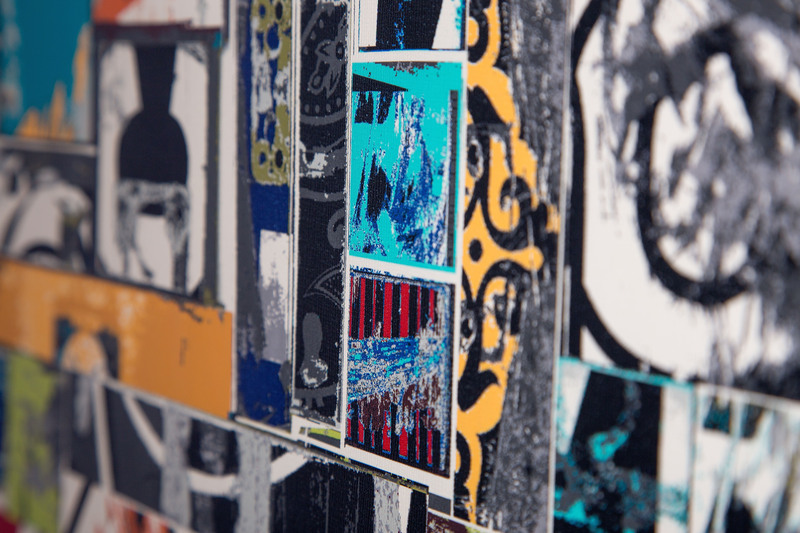 Shop Art of Board textiles HERE.